In most cases, parvo virus symptoms are not exhibited unless a carrier dog is stressed or exposed to certain conditions. The incubation period of viral infection is limited to 3 – 10 days and parvo virus symptoms are exhibited only after the incubation period is over. It has been noted that during the clinical course of the disease, it is hard to diagnose the parvo virus infection through general laboratory procedures, therefore a detailed clinical examination and history is required before going for a confirmatory serological test of parvo virus infection. Parvo Dog Symptoms are related to the small intestine and declines in nutrient absorption. This podcast from the American Veterinary Association on parvo virus in dogs provides a helpful overview of the disease including signs of parvo and treatment advice. Clinically, at first, a dog may show signs of parvo such as unrest, lethargy and mild diarrhea, which is followed by severe bloody diarrhea that also has a bad smell. Signs of dehydration also start to appear such as sunken eyes. As the disease develops a dog becomes more lethargic over time and more severe symptoms start to appear such as of vomiting; anorexia followed by overall loss of body conditions. Puppy Parvo Virus Symptoms include lethargy and weight loss. 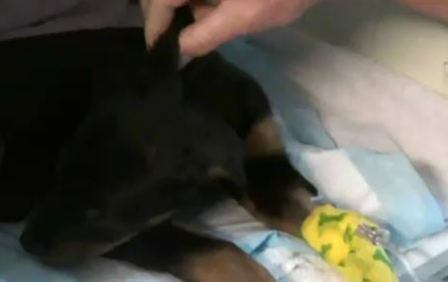 This puppy parvo patient is receiving IV fluid. When a dogs skin can be pulled from the body above the head, and if it doesn't snap back in place, the dog is dehydrated. in this case the puppy is 10% dehydrated. This is most common manifestation of the disease. There are two different clinical forms of parvo virus infection in dogs, i.e. Gastroenteritis and Myocarditis. Gastroenteritis is characterized by the bloody diarrhea, vomiting, lethargy and dehydration, while myocarditis is a severe weakening of cardiac muscles due to the infection. Proper immunization and preventive measures however, have eliminated the myocarditis. Gastroenteritis is more common in dogs age 6 – 20 weeks, because at this stage of life the immune resistance towards parvovirus starts declining. This is why a “booster” dose of vaccine is required to ensure that the puppy can fight off the disease. . A dog with parvo virus symptoms may show signs for more then 8 – 14 days, and may recover if treated properly or has a strong enough immune system to combat the infection. 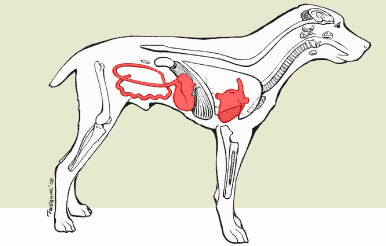 Many dogs may die within hours of clinical exhibition of symptoms from of dehydration and stress on the body. Therefore, immediate response to any clinical signs of parvo is necessary to save the life of the patient. Secondary infections, caused by bacterial species in the intestine of the dog that take advantage of the weakened immune system may worsen the condition, therefore severe additional symptoms can appear due to infection, such as fever; lethargy and overall progressive weakness due to bacteremia and/or septicemia. A dog showing any of the aforementioned symptoms, especially those which are noticed during the first phase of parvo virus infection should not be taken lightly. A veterinarian should be contacted or visited immediately. Symptoms of diarrhea; bloody diarrhea and bad smell along with lethargy and stress should be suspected as being parvo virus symptoms. A veterinarian may conduct a detailed clinical examination and history regarding your dogs routine and dietary management. Stress along with diarrhea without any recent change in diet is sometimes a clear indication of possible parvo virus infection. After a clear indication, a veterinarian will recommend serological tests and blood tests which confirm the occurrence of the disease; though it is hard to diagnose after the incubation period is over. However, a dog sheds the virus in feces for 8 – 14 days after clinical exhibition of disease. Additionally, a recovered dog may shed virus in feces for longer periods of time. There is no specific treatment for viral infections in general, let alone canine parvovirus. Since related symptoms such as diarrhea, vomiting and dehydration can cause death; it is necessary to provide immediate support such as fluid therapy, even before the diagnosis. Symptoms are controlled with supportive measures, such as the administration of fluids, natural remedies and home recipes. A dog with signs of vomiting should not be administered fluids or food through the mouth or oral route, with preference for the administration of intravenous fluids and electrolytes instead. Once, the signs of vomiting are controlled, a dog with other pavro symptoms and secondary infections can be administered natural remedies, fluids and liquid food through the mouth/oral route; in low volumes initially with a slight increase as the dog recovers. Parvo–K: Ingredients selected to provide a natural parvo symptoms vaccine; formulated to boost hydration and normalize body temperature. Immunity & Liver Support: supports the immune system. Runi Poo Relief: helps the body form firm stools. Energy Tonic: To help restore normal energy levels. Note that natural remedies are not a parvo cure (there is none), but for added support to help speed recovry and to aid the body in resisting future infections. Antibiotics should never be administered to a dehydrated dog, and therapeutic administration should only be initiated after early recovery from parvo virus symptoms. Parvo virus symptoms can be prevented by timely vaccination. A puppy should be administered the first dose of vaccine at age of 5 – 8 weeks, preferably with a high density of viral antigen, followed by a second dose at age of 16 – 20 weeks. An annual booster dose is required to keep the dog protected from the viral infection in later stages of life. Additionally, preventive measures such as improved hygiene, regular supportive natural care and improvement in energy levels during prone periods of disease can surely improve conditions for the dogs at risk for parvo virus. Again, if you see or suspect any parvo virus symptoms, visit your veterinarian.